When we are in love we say that we give our heart to the person we love. Jesus gave all his heart. He cried out, “it is accomplished” meaning to satisfy his divine heart he had given all. Jesus loves you and wants to share in your life. The Cross is a doing of love. Amidst the pain and suffering Jesus spells out a love that is unrivalled. 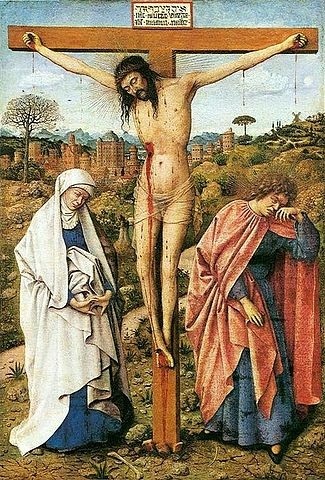 The Son of God was brutally crucified, offering himself for our transgressions. As Isaiah prophesied, Jesus became the man of sorrows pierced through for our faults, crushed for our sins. God became man to die so men and women could be set free from sin and death. Suffering tests our resolve. Can you imagine being humiliated, tortured and hated as Jesus was. As he died, God’s Son offered his life for you that you might understand how much you mean to God. This great act of love embraces all of us. Your God is Love and through the merits of the Holy Cross and Jesus’ death, new life is offered to all. This love God has for you can heal your interior wounds that come about by those times you thought you were not loved. When we accept God’s love we become open to a profound relationship of interior intimacy with God. This intimate and personal love flowing from the Cross, flowing out of the heart of our God, is very beautiful. There is no greater love that we can experience. Jesus is the greatest lover of all. Jesus gave everything to share in our life. He didn’t hold back! His love conquers all. Jesus just asks us not to hold our hearts back from him. Rather, he wants us to love him with everything and every fibre of our being. Jesus loves you. Jesus thirsts for your love. No matter what you have done, Jesus loves you for your own sake. Come to him with your misery and sins, with your troubles and needs, and with all your longing to be loved.